0,7 l -55% vol. alc. The Studer Absinthe can look back on a long tradition. The Distillery Studer is based in Escholzmatt near Lucerne in Switzerland. 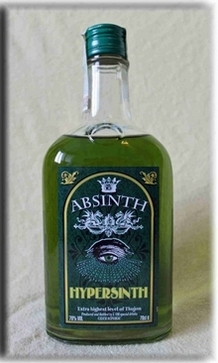 This put forth to the prohibition of absinthe absinthe products. Thus, in the Distillery Studer exists a great knowledge of absinthe. In the Studer absinthe wormwood and seven other herbs is used along with alcohol and fresh spring water from its own sources. Prepare Absinthe Studer in the ratio of one to four mixes with fresh water and provided ad libitum with one or two pieces of sugar cubes and possibly an ice cube to . The Studer Absinthe is also another reason something special. For, according to Swiss tradition are Swiss Absinthe mostly uncolored, just Swiss La Bleues . 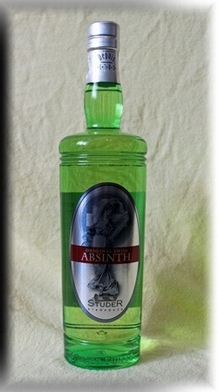 The Studer Absinthe , however, is stained very intensely green , which is achieved by the chosen herbs for several months macerated in neutral alcohol. So give the herbs from their green color .